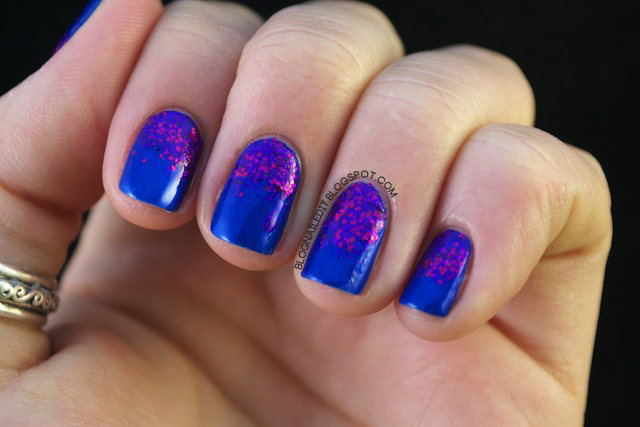 For today I've got a glitter gradient gradating from a magenta glitter up toward a royal blue. I pulled out two somewhat dusty, unused colors from my Helmer to get this manicure. They both live in the same drawer, which is a hodgepodge of Essie, OPI, Wet n' Wild and a few other mismatches that don't have enough family members to buy their own Helmer drawer. Don't feel sorry for this drawer though, it's quite a party in there. The Kleancolor Chunky Holos and the entire Wet n' Wild Color Icon collection live in there. Solids and neutrals beware, this drawer's trouble! I love the combination of these two royal, jewel toned colors paired together that comes across even more stunning in real life. Back Alley Deals and Saved by the Blue both come from Wet n' Wild. Saved by the Blue is one of those polishes that's always on the shelf, but you'll be lucky to find anymore Back Alley Deals. That collection was a limited time assortment of glitters only available at Walgreen's, and of course, only for a limited time. It's cruel how companies insist on creating the best polishes for only a limited time, and leave their less inspiring shades out year round. These two are gorgeous together! Wow. I love this. I want back alley deals so so so bad! I've always seen the sponging technique used on the tips, but had never thought of applying it to the base of the nails. Interesting! For this I actually just used the brush that came with the glitter. 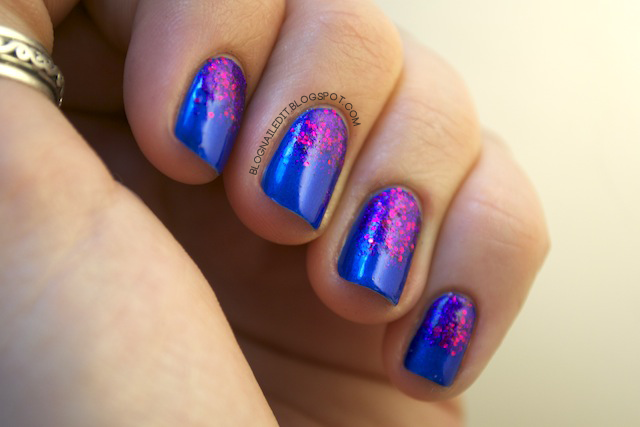 Glitter gradients are super easy, whether you go top-down or bottom-up. Check out my tutorial here for exactly how I did it! Oooh I love this combination! So bold and so pretty! I was literally laughing out loud at your Helmer party scenario! You're an awesome writer and this is a gorgeous gradient! cute! what application do you use for the watermark of the blog in the picture? Just Photoshop. I use the pen and type tool to get the curved effect.